Bio: Brown’s combat sports career began as a way to get in shape after giving birth to her daughter. It wasn’t long after that Brown started her boxing career, turning pro in 2012. 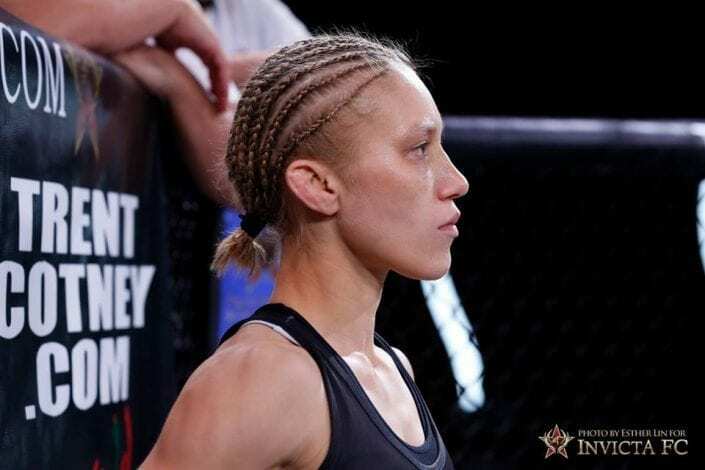 Less than a year later, Brown turned pro in MMA and reeled off three wins in her first four fights. Her success led to signing with Invicta in 2014, where she debuted at Invicta FC 9 and quickly made her mark on the atomweight division. My days are usually very busy. I live 40 miles away from the gym. When I get up, it’s either go for a run, or maybe hit my Aqua Bag for a few rounds. Then I will get ready for the gym, either a private session with one of my coaches, or maybe some boxing or Muay Thai, and some padwork. After a few hours of training, we will go back home, eat lunch, & rest up for evening training. A few hours later, we’re on the way back down to the gym to get some wrestling and MMA training in. Then some Muay Thai or Jiu Jitsu, and maybe more pads. I am there another 3-4 hours in the evenings. Once we leave, go home eat dinner, and get ready to do it all again the next day! There are quite a few things that are motivation for me. My daughter is huge motivation. My husband motivates me everyday, day in and day out. They are the main reasons I do what I do. Invicta FC motivates me. My Wildbunch team and coaches motivate me. Also, to hear that I inspire others is complete motivation. One hidden talent that not much people know about me is that I am pretty good at ice skating. Not as good as the pros, but I like to think I am good! One person that I have always wanted to meet, Cris Cyborg! I have always looked up to her. If I could be any fictional character, I would choose She-Ra, also known as The Princess of Power. The most powerful woman in the universe. She can take out grown men & robots, incredible strength, extremely fast and acrobatic. She also understands mental communication with animals and has healing powers.